The Chrysler 300 is a beautifully designed luxury full-sized sedan that will provide an exceptional driving experience. With eight different exterior colors, there's something for each person's unique style. To make driving at night easy and safe, the Adaptive High-Intensity Discharge Headlamps with Automatic Leveling will monitor your speed and steering angle. The direction your headlamps are pointing will change in order to light up the road as well as possible. 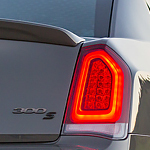 The Chrysler 300 can also come with Automatic High-Beam Headlamps that will turn on and off as the sensors detect change in the ambient light conditions. Yucca Valley Chrysler Center will be happy to show you all of the different ways you could customize your Chrysler 300. There are nine different wheel options available. Whether you want 17-, 18-, 19-, or 20-inch wheels, there will be something that you'll love.